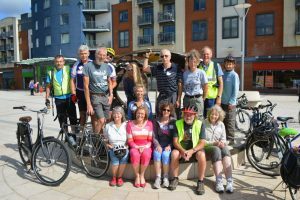 The bike ride to celebrate the 225th birthday of local poet Shelley took place in glorious sunshine. Ride organiser Thea Bredie sent this report. 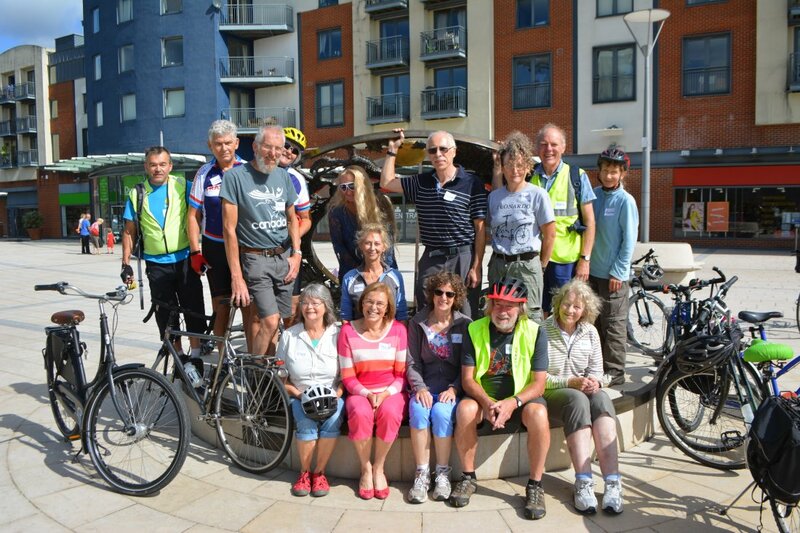 At 10 AM on the morning of Friday 4th August 15 local people gathered around the Heritage Sundial on the Forum with their bicycles, about to set off on a celebratory birthday bike ride. There were two birthday boys, Geoff, one of the riders, and Shelley, born at Field Place on 4th August 1792. The lovely sundial set the historical scene for the poet’s life, featuring St. Leonard’s Forest complete with its dragon, Sussex iron workers, Sussex farmers and Shelley’s first poem “To A Cat In Distress” among many other subjects. The group then visited the Causeway and St. Mary’s Church and discussed Shelley’s grandfather and his Arun “Cottage” at the end of the Normandy. The Riverside Walk was the route for the best part of the ride, following alongside the Arun and then its tributary Boldings Brook, also known as the Red River. A riverside stop was a good opportunity for celebrating the poet’s love of all things natural with some quotations. Shelley’s first known letter, to his aunt Kate in Horsham was a cheeky and rather peremptory “request” for her to bring “a fairing” of gingerbread for a picnic at Warnham Pond, or else . . .
At the end of the ride the group gathered over coffee and Horsham Gingerbread at Warnham Nature Reserve’s café, to sing and to celebrate birthdays and the delights of life and poetry together. Participants called the morning very interesting and said that they had learnt a lot. They also praised the poetry selections and said that the information provided linked well with modern life. They requested more rides and so we hope to add a ride from Horsham to Warnham church in the future. What is stopping us, for now, is the lack of a safe route between Horsham and the village. . .